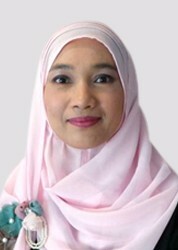 Ida Yasin is a Knowledge Management specialist. She is a registered expert with the Asian Productivity Organization (APO) in Tokyo and has contributed in the area of research and training. She has co-authored four books on knowledge management published by the APO. She has worked in the area of knowledge management, productivity and business excellence with the public and private sectors the past 22 years. Ida obtained her doctoral degree in Quality and Productivity Improvement, master’s degree and bachelor degree in Economics.